Windows Defender can be used offline to remove malware from your computer. If you think your PC might be infected with Viruses or malware, you can follow the steps as provided below to remove Malware using Windows Defender. 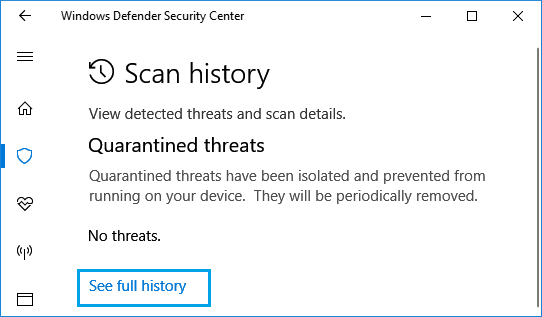 While regular Windows Defender scans can remove malware, using Windows Defender offline is recommended, in case your computer appears to be infected with hard to detect or persistent type of malware. Certain Malware types like rootkits have the ability to bypass the Windows shell and can often avoid being detected during regular scans. When Windows Defender is used offline, it scans your computer from outside the Windows Kernel, which allows it to target rootkits and other viruses, trying to infect or overwrite the master boot record. Follow the steps below to perform a offline malware scan using Windows Defender tool. 1. Click on the Start button, scroll down the list of Apps and click on Windows Defender Security Center. 2. On the next screen, click on Virus & threat protection. 3. Next, click on Advanced Scan. 4. On the advanced scan screen, choose Windows Defender Offline scan option and then click on Scan now. 5. 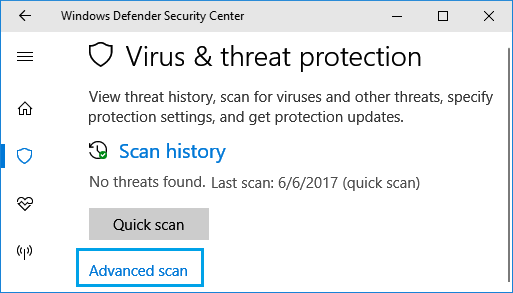 On the popup, click on the Scan option to start Windows Defender Offline Scan. Now, your computer will automatically restart, booting Windows Defender Offline, instead of the regular Windows 10 environment. When the Windows Defender offline scan is completed (10 to 15 minutes), your computer will restart again. This time Windows 10 operating system will be loaded and you will see your regular login screen. Once your computer restarts, you can take a look at what was removed during the Windows Defender Offline scan. 3. On the Virus & Threat Protection screen, click on Scan history. 4. On the next screen, click on See full history link located below Quarantined threats. 5. If any viruses were removed during the offline scan, you will be able to see them on the scan history screen.